The Florence table encompasses a sleek glass table top within a timeless aluminium frame. Florence will bring a modern touch to your outdoor space, providing an extendable solution for any occasion, making it the perfect table for your garden, patio or decking. To match the table, choose 8 stacking chairs from the options available. The chairs have aluminium frames that are light and strong and are fitted with an outdoor mesh fabric that is sturdy and comfortable. Please make sure the safety locks (which are on the underside of the table top) are unlocked before extending your table. The Florence table & 8 chair set in Grey has been so popular that we have sold through the entirety of our available stock for 2018. We will only be making 28 of our Florence 8 seater rectangular table sets for the 2019 season, so time is of the absolute essence. Place your pre-order today, guarantee yourself your table set and pay nothing at all until a week or so before dispatch in 2019. Simply add the set to your basket and choose 'Bank Transfer' at checkout. The Florence table & 8 chair set in Grey and its sleek, smooth metal finish will be the envy of guests, friends and family alike. For those who prefer to go a step bolder and more definite in their colour palettes, we can also offer you the Florence in deep Black, cool White & Grey or lavish White & Champagne. Don't forget to look at our gifts section above where we offer amazing discounts of 30-70% on a wide range of products to complement your purchase of the Florence table set. The quality and style of the furniture is superb! The customer service team were very friendly, polite and efficient - they helped answer any questions I had and placed my order promptly. My furniture was delivered to the Republic of Ireland and was received within 3 business days of placing the order. The quality and style of the furniture is superb! Very helpful during the order process as I wanted different chairs to the set being sold with the table. Order arrived on time with good communication from transporter. Everything well packed on a pallet,delivered to site. 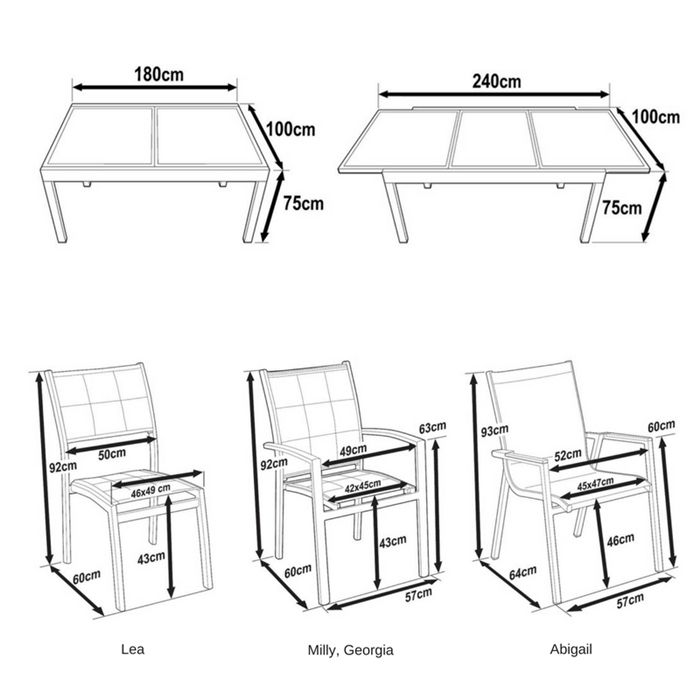 Good simple instructions for table assembly,which was very easy to do. Chairs very comfortable .so far very pleased. Delighted with the Patio set in terms of quality and value for money. 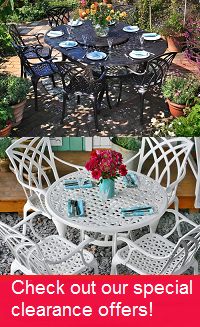 Delighted with the Patio set in terms of quality and value for money. Particularly pleased that there was only a minor amount of assembly required and that the set was so well packaged.